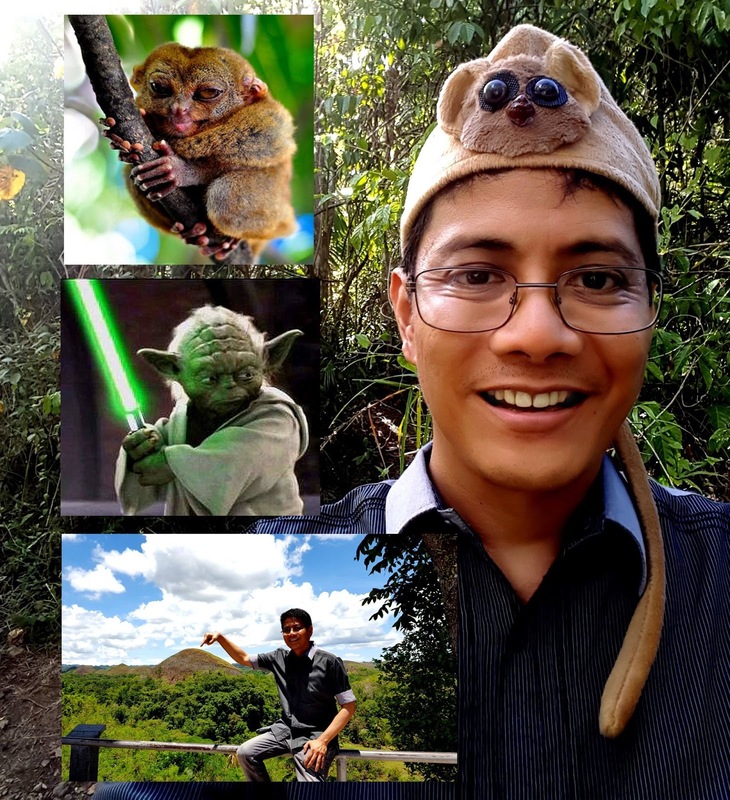 Randy Dellosa: Suicidal Tarsiers Need Psychiatric Help,Too! 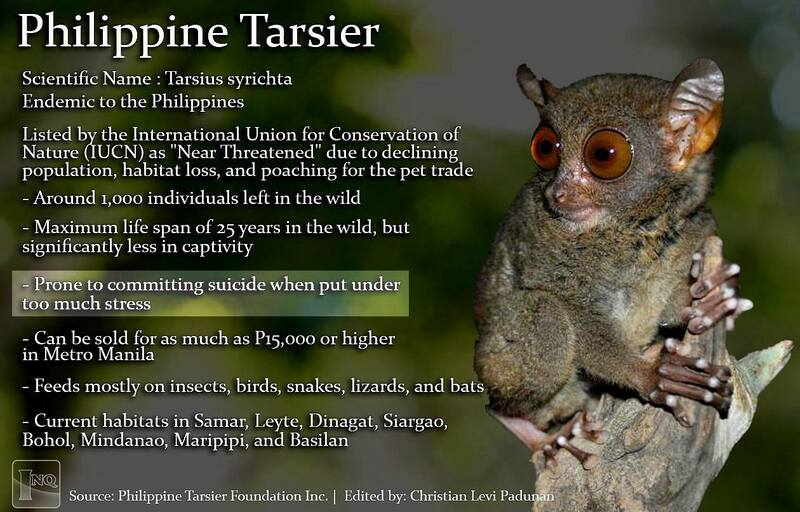 SUICIDAL TARSIERS NEED PSYCHIATRIC HELP, TOO! If tarsiers were rough and tough and rude and crude, they would probably be called "Dutartiers" in honor of President Duterte. 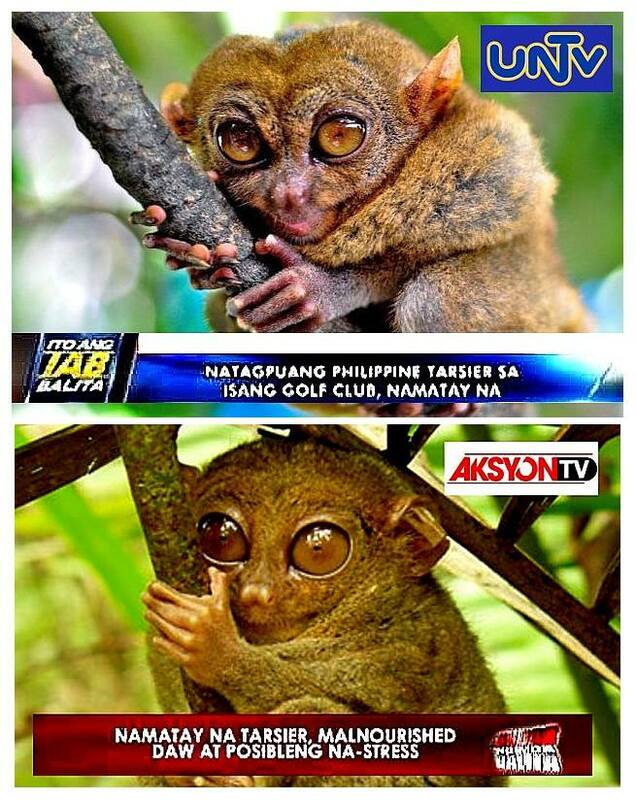 But unfortunately, tarsiers are a far cry from Digong. The cute and cuddly tarsiers are weak and meek little critters that need all the protection they can get. In human captivitiy, tarsiers live for only 2 years or shorter. But when they are placed in ideal environmental conditions, tarsiers can live a maximum of 25 years. 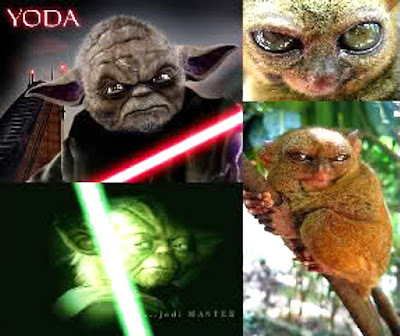 Only one tarsier is known to have lived up to 900 long years and it's name is Yoda. Yoda may have been a master at controlling "The Force," but he miserably failed at grammar. Even on his deathbed, Yoda's grammar sucked as his dying words were "Sick have I become." If tarsiers could be diagnosed with a psychiatric disorder, it would be a "schizoid personality disorder." Schizoid personalities are characterized as 'loners." Tarsiers are very schizoid, that is, they are very solitary and introverted creatures. In fact, each tarsier will need at least 1 large hectare of personal space, away from any other tarsier. They are allergic to being touched and dislike the blinding flashes of light from cameras. 2) Tarsiers have murderous sexual behaviors. If a female tarsier intruded into the territory of a male tarsier, the female tarsier could get killed if it was considered unattractive (or “fugly”) by the male tarsier. Wow, talk about high standards! 3) Tarsiers can get depressed and suicidal. Tarsiers have very low tolerance to stress. In human captivity, they get stressed, anxious, and depressed. When their stress gets too much to handle, tarsiers go emo and commit suicide by cracking their skulls open through head-banging. LET'S PROTECT THIS ENDANGERED SPECIES FROM GETTING EXTINCT! 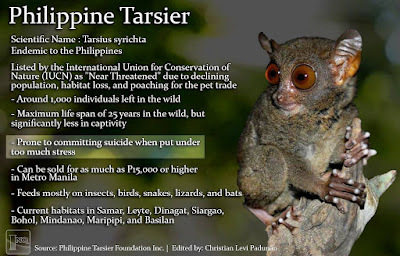 - Don't keep tarsiers as pets. - Don't buy captured tarsiers in the pet market. - Report cases of hunting, killing or smuggling of tarsiers. 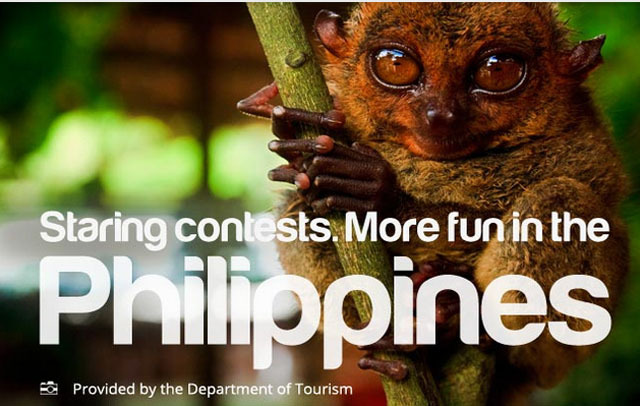 - Do not patronize outlets displaying illegally-acquired tarsiers. - Donate to organizations which support tarsier research and conservation. THERE ARE 1000 REMAINING TARSIERS IN THE PHILIPPINES! The tarsiers need us to survive. Let us participate in protecting them, so like Yoda, they can have the opportunity to live up to the ripe old happy age of 900 years!